When I first started using the Soothe plug-in, I’ll admit to having mixed feelings. I liked what it did when I threw it on a vocal that was sounding a bit harsh, and I was also amazed at what it did to some nasty-sounding cymbals on a drum kit I was mixing. On both occasions, though, I didn’t really understand what it was doing! I didn’t have to change any of the parameters, and although I enjoyed the results, I do like to know what it is that something is contributing, so that I don’t become reliant on a mysterious tool — even if that tool does make mixing a bit easier. As I’ve spent a bit of time with Soothe, however, I’ve developed more of an understanding of, and appreciation for, just what a useful tool it can be. Finnish company Oeksound say that Soothe started out as a vocal processing tool, and describe it as a “dynamic resonance suppressor for mid and high frequencies”. When mixing vocals, it can often be effective to ‘notch out’ a few specific frequencies with very narrow-bandwidth parametric EQ bands. Identifying areas of the sound that contain unpleasant resonances and removing them can introduce a smoothness to a vocal, and can also allow you to get a bit more heavy handed with tone-changing EQ or compression if required. 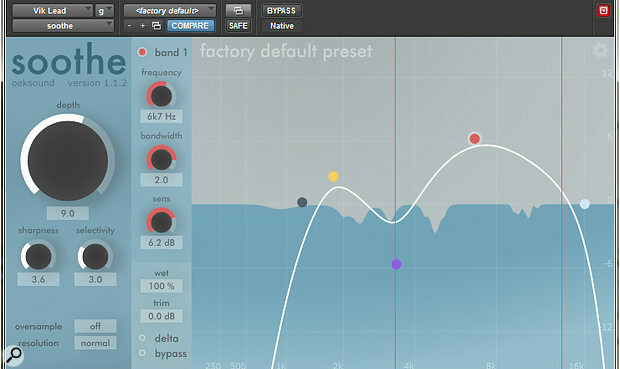 Oeksound have developed an algorithm that can automatically identify these problem areas in a source and, rather than imposing fixed EQ, Soothe applies attenuation dynamically as and when it’s needed. 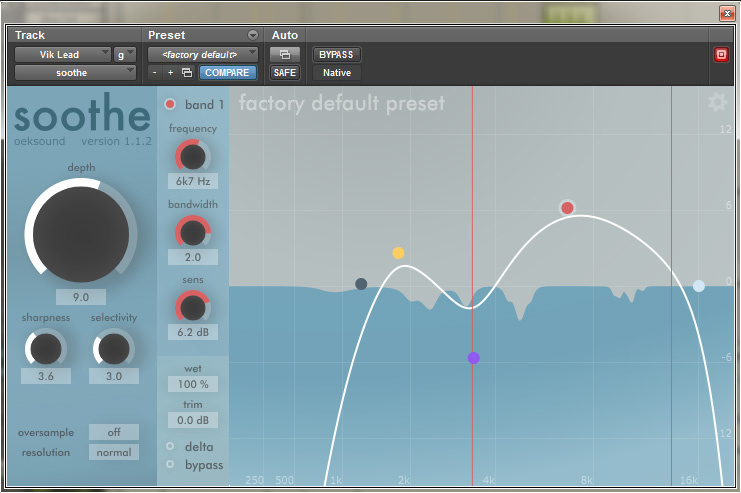 Oeksound claim it has the potential to offer much more natural results than manual EQ or broader multiband compression. Quite how it is achieved remains slightly mysterious but it is, apparently, the result of seven years’ R&D, and employs a proprietary process that introduces minimal artifacts. Just slapping the plug-in on a track often works surprisingly well, but after a brief look at the manual, you quickly begin to get a feel for how to use it in a more focused way. Soothe has a real-time graphical display that enables you to steer the processing more towards certain frequency regions, and has a master ‘depth’ control that governs the overall amount of ‘resonance suppression’ applied. Broadly speaking, it offers five bands of processing, with each band having separate controls for frequency, bandwidth and sensitivity. Two of the bands are tied to the top and bottom of the frequency range, while the remaining three bands you use to pinpoint areas that you want Soothe to target. Clicking on a band’s node in the graphical display and dragging it upwards tells Soothe to do more work in that region, while dragging a node downwards tells it to leave that frequency range alone. One simple way of using it, for example, would be to boost one of the bands to focus on the 4-7kHz region, to make it act somewhat like a traditional de-esser on a vocal. Additional global controls are also available for ‘sharpness’, which influences how narrow or broad Soothe should make its individual EQ cuts, and ‘selectivity’, which is an overall control for how fussy Soothe should be about identifying problem areas. Also worthy of mention are the overall wet/dry blend control for parallel-style processing and a ‘delta’ button that lets you hear just the frequencies the plug-in is suppressing. It’s very easy to get up and running with Soothe, and initially, it can be very addictive — you have been warned. It can be an effort to remember that we don’t necessarily want everything in a mix to be nice and smooth-sounding! Its bread and butter is vocals, and a simple way of using it is as a ‘de-esser on steroids’. Quite often just inserting it on a vocal track lets it work its magic straight away, but as I’ve got a handle on the controls, I’ve found myself just giving it a little help by focusing on a particular area that I want to be targeted. I seem to find frequencies around 2kHz to be quite offensive on a number of sources, but also recognise that this range and just above is important for maintaining the clarity and diction of many voices. I found that using the control bands to create quite a narrow, focused region around 2kHz and a broader ‘de-essing’ region higher up gave me a winning combination on a number of singers. Often I use Soothe first in my vocal chain to remove anything unpleasant before compression or EQ, and then use just a touch of more traditional de-essing as the final stage. Its usefulness is not exclusive to vocals by any means, and Soothe is also a great way of smoothing out drum overhead or spot cymbal mics that can have some unpleasant ringing effects from 4-5kHz and upwards. Acoustic guitars, with their squeaks and finger noises, can also be notoriously difficult to tackle post-recording, and Soothe could be a very powerful tool if you work with these a lot. I’ve also found good use on distorted electric guitars and even, on one occasion, on a whole mix. Like any advanced processor, it doesn’t always work, and it can sometimes be a little unclear why Soothe does or doesn’t benefit certain sources. Even once you’ve got to grips with the controls, Soothe retains a slightly mysterious quality, which some will embrace while others will feel a little wary of it. Oeksound offer a fully functioning trial of Soothe from their web site, but if you try it, I would recommend making sure you have the funds to then go and buy it, as it’s a very clever and powerful mix tool that can quickly become hard to work without.